I am feeling the burn. No really. I am literally feeling the burn. I’ve got a little sore on my right index finger. It’s tiny. No bigger than >>>>>this<<<<<. Itty, bitty, eenie-weenie. It’s a wool burn. It’s what happens when the Weekend Warrior Knittelete thinks she can leap into the Olympics, going from the casual sock knitting to the full-body contact sport arena of the stranded wool sweater. It is so small, yet so mighty. It hurts like holy heck. I am going through Band-Aids at a remarkable clip – a session of knitting wears right through it. Also, when I got into the shower last night and started washing my hair, I let out a yelp of surprise that was both loud and rather stupid – I knew the sore spot was there, what did I honestly think was going to happen when I first put soap on it and then thrust it into my hair under stinkin’ hot water. Thank God I’m not in the Scientific Thinking Olympics. I’d be sunk. Undaunted, however, I have been making progress! OK, maybe it’s hard to see the actual progress. 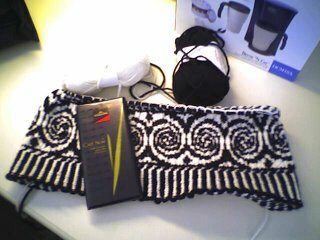 But the bottom pattern is now complete, and I’m starting on the body pattern. The body pattern, I am excited to report, is much simpler: I’m already getting the rounds done faster and the pattern is much more geometrically simple than the bottom band. Note that I have yet another tool of the trade included in this picture. This would be Valrhona Café Noir, a dark chocolate bar from France. It is supposed to have a coffee flavor, but I’m not really getting that. Just chocolate. And I’m OK with that. I really, truly am OK with that.